As I’ve said, I’ve been in a bit of a rut looking for knitting inspiration. I like projects where I learn new techniques. 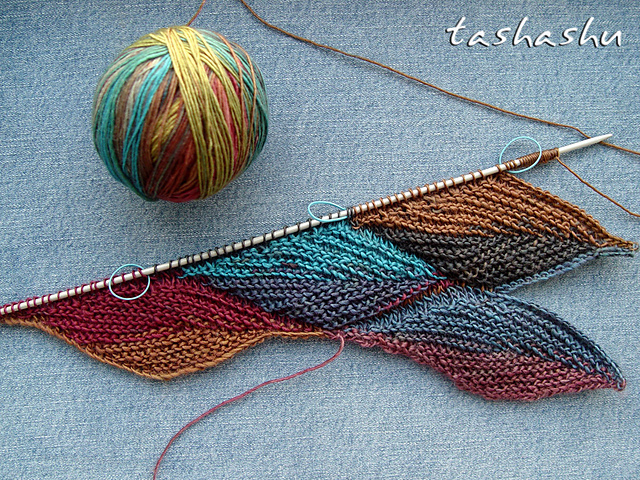 Lately, I’ve been taken with using multi-colored yarn in ways that break up the usual stripes. Here are three projects that have caught my interest. I actually purchased some yarn for this particular scarf and am looking forward to trying it out. This is not a knit. 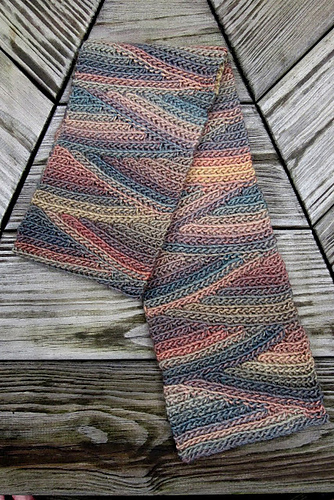 It is a technique called slip slope crochet. It’s been a long while since I’ve picked up a crochet hook, but I can’t resist how well the technique manipulates the yarn. It is the crochet version of short-row knitting. This is a stitch design by Svetlana Gordon. If your not familiar with her work check out her projects. They are mind-blowing. I’ve been up to my eyeballs with a lot of stuff. The biggest of the projects was painting the inside of an entire house, walls and ceilings. It’s one of two houses owned by my mom that my great-grandfather built back in 1893. I love both of the houses and spending time to care for them. I thought, mistakenly of course, that painting all 7 rooms and taking time to be alone with my thoughts would be relaxing in a meditative sort of way. 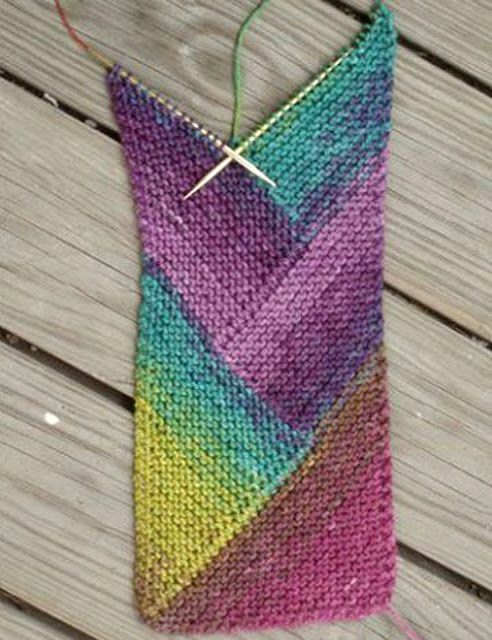 It would be just the break I needed from knitting the forever shawl–a shawl that will never end. I couldn’t have been more wrong. I don’t know how professional painters calculate the amount of paint needed to complete a project. I, however, calculate that out of one can of paint 60% of the paint will end up on the walls and 40% will end up on me. For ceilings my calculation is 50% ceiling and 50% me, the ladder, the tarps on the floor with splatters on the wall. It is amazing to me how so much paint can get on so many things other than walls and ceilings. I had paint on my cell phone, in my hair, somehow it got in the car, my sneakers were trashed with paint. At the end of a day I looked like something one would see on Halloween night. I had paint on my face that I peeled off like a facial mask. The paint in my hair acted like sculpting gel and my hair stuck out in all kinds of spikey ways from my head. Still I kept on painting. On the third day I realized that I had developed a distinct wheeze at the top of my left lung. I had spent the last few days paint in a house that was never above 60 degrees (15 C). Since it was on the left side where I had my mastectomy and radiation treatments I immediately jumped to the conclusion that I now had lung cancer. I spent two more days of torture painting and being alone with my thoughts which now all centered around lung cancer. After all, that was what happened to my friend. The radiation treatment for her breast cancer caused her lung cancer that she is now battling. I finally went to the doctor. He listened to my chest proscribed and antibiotic and cough medicine. I thought he was nuts. Antibiotic and cough medicine for lung cancer? He said it was acute bronchitis. But by this point I had spent so long with my own thoughts that I insisted on an x-ray to prove him wrong. I went down to the hospital to get the x-ray and went through a prolonged check in procedure. Three days later I call my doctor for the results. I was standing on the ladder doing the ceiling as paint dripped down my arm. He didn’t have the results. I called the next day and the day after. Same thing: no results. While repainting the door I inadvertently leaned against while it was still wet, I decided to call the hospital and see what the hold up was all about. I had just dipped the brush into the can and was going to apply it to the door when the hospital employee tells me they have no record that I was ever there. I heard the paint splatter as it dripped from the brush onto my sneakers. How could that be? My lung was really getting worse and I was wheezing more. I needed to get the paint job done. I didn’t have time to chase my x-rays all over the hospital so I decided I’d wait until next month when I saw my oncologist to get a verdict. Then the bill arrived from the hospital for the x-ray. That’s when I decided to take some time off from painting and go down there and straighten this mess out. It took half the day, but in the end they did find the x-ray. No I don’t have lung cancer, but I do have acute bronchitis. They told me to take the antibiotics the doctor prescribed. The painting of the house is done. My course of antibiotics is done, but I still have the bronchitis. I went to my doctor yesterday and he says there is nothing more he can do. This seems ludicrous. So once again I am waiting to see my oncologist to see if he has some suggestions as to what can be done or whether this is something I am going to have to live with. In the meanwhile I am knitting the forever shawl and charging the battery to my camera so I can show you a picture of it.